November 15th, 2016 | Moving For Work. One of the most often repeated pieces of moving advice is “If you don’t need it, don’t move with it.” This principle applies to more than just clothes you no longer wear, books you won’t ever read, and decor you never display. When you prepare for an office relocation, it’s also important to consider reducing your inventory, consolidating your records, and disposing of any unusable equipment. In this blog, we cover one of the trickiest forms of office relocation waste: used electronics or e-waste. We discuss some of the most common forms of disposal and what you should do to prepare your electronics beforehand. Buyback programs – Some companies, such as Staples and Best Buy, offer buyback programs for a range of electronics. Most of these organizations accept devices regardless of where you bought them, but check company policies before bringing in all your old computers. Donation – If your equipment still functions as it should and your business just needs an upgrade, consider donation. Donating your electronics keeps them out of a landfill and can benefit programming students, lower-income families, and local charities. Manufacturer takeback – Manufacturers like Apple, Dell, and more offer takeback programs for defunct electronics. These programs don’t usually pay or cost anything, they simply ensure your e-waste gets recycled. Recycling – Recycling offers one of the most responsible and sustainable options for e-waste disposal. Look for a national or local recycling facility willing to take your items. Before you move your electronics, double-check the capabilities of your chosen recycler. Some e-waste facilities can only take cell phones and similar devices. Reselling – If you own all your current e-waste free and clear, you may have the option to resell certain items to help finance your move or new electronics purchases. However, if you have any questions about item ownership, consult with legal counsel before trying to sell commercial e-waste. As you determine which option works best for you, keep your ownership status and local regulations in mind. For example, you cannot resell a device that belongs to your company for individual profit. And for some specialty electronics, such as machinery operating devices, you may not have all of these options. Collect and inventory all of your e-waste. If possible, come up with an estimated value of the included equipment. Pair all matching equipment together for takeback or donation. If it’s possible your device will be re-used, include all the parts you have including cords, mice and keyboards, remotes, external memory devices, etc. Separate removable pieces that have different recycling procedures. Some electrical components require different recycling practices so remove batteries, light bulbs, and ink cartridges before turning in your devices. Wipe any memory cards and hard drives. Protect your interests by removing any and all sensitive information from your electronics, including records, employee resources, and company messages. During the preparatory process, check with the recipient of your e-waste. The organization may ask you to comply with other guidelines not found here. For example, a recycler may restrict the kind of containers you can use to transport your e-waste. Check in advance to avoid any hold-ups. 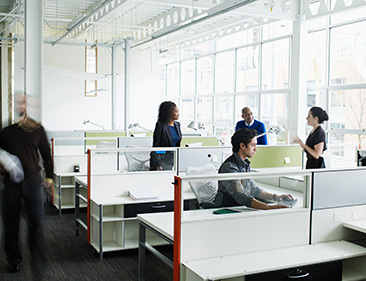 Don’t let aging computers slow your business down in your newest location. Use the information listed above to clear the way for newer, faster equipment that will benefit you, your customers, and your employees.